← Last Chance Call for Margarita Day! Collaborating with a designer new to me is especially wonderful when it results in a beautiful design. 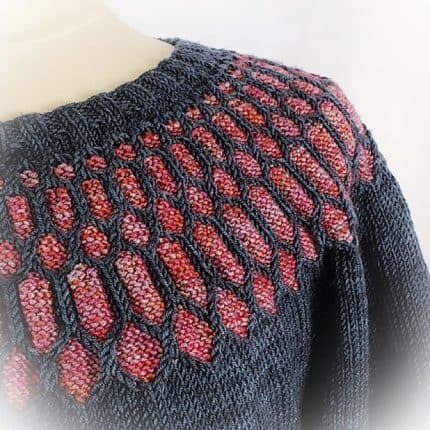 When Deb Gerhard of Spruce Lane Designs originally contacted me about a colorwork sweater in DK weight I was very excited. The excitement grew when she started sending me teaser photos of the sweater. Once Again debuted at VKL NYC this past weekend and it was a blast to wear the sweater – I have never been stopped so many times for something I was wearing. 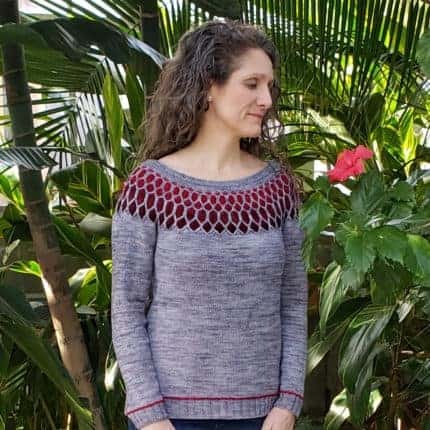 Once Again is a top-down, pullover sweater; knit in-the-round with a fair isle yoke that is coupled with simple cable stitches. 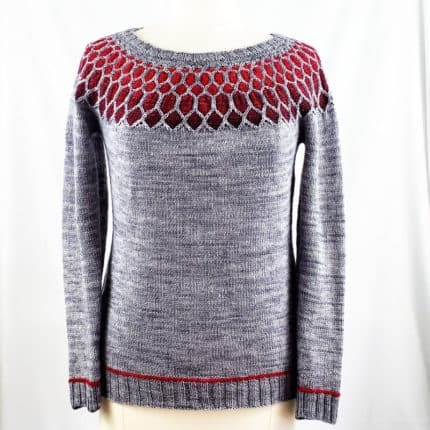 Short rows are used to shape the neckline after the fair isle yoke pattern is completed. Gentle waist shaping gives way to a slight A-line look at the hips resulting in an approximate 2½” to 2¾” larger hip circumference than the chest circumference. Two different versions are shown: the first uses Marianated Yarns Playtime DK in Drizzly Day for the Main Color with a Jujubee DK gradient set in Unchained Melody for the yoke. The second version uses Playtime DK in Spelunking for the Main Color with Hippy Hippy Shake for the yoke. I’ll have both samples with me along with plenty of yarn to choose from at my trunk show at The Knot House this weekend in Frederick, Maryland. In a few weeks, both samples will be traveling me to Stitches West at the Santa Clara Convention Center in California. I’ll be at booth #1233.